CLEARWATER, FL, US, December 6, 2018 /EINPresswire.com/ — On December 1st, the Church of Scientology Choir donned Victorian-style attire and took to downtown Clearwater’s Cleveland street to sing Holiday favorite sing-alongs and Holiday cheer. Along the way, families joined to listen and children participated in the performances with bells and hand held percussion instruments. The choir’s final destination was Downtown’s Century-Old Historic Clearwater Building, now housing the Scientology Information Center. The audience took videos of the choir and children playing the instruments, capturing the experience. On December 7th, the Scientology Information Center will host a Holiday Concert with Ms. Joanie Sigal from Broadway and Beyond. She will perform an eclectic mix of favorites including Broadway, romantic ballads, pop, blues and a selection of holiday favorites. To learn more about the Scientology Information Center and future events please contact Amber Skjelset at (727) 467-6966 or email amber@cos.flag.org. The Scientology Information Center, located in the Historic Clearwater Building in downtown Clearwater, opened on July 11, 2015, and currently houses a gallery of audiovisual displays with some 400 videos. The Center is open to all and provides a self-guided tour showing basic Scientology beliefs, Churches around the world, ongoing social programs and the life of L. Ron Hubbard, Scientology’s founder. 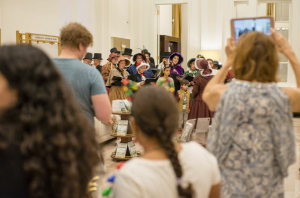 The Center offers tours to the broad public and civic leaders; holds concerts, theatrical performances and receptions for the community; and opens up the use of its conference room to social, civic and non-profit groups. For more information on Scientology, visit www.scientology.org or the Scientology Network on DirecTV channel 320, or streaming at www.scientology.tv or apps at appleTV, fireTV and ROKU.